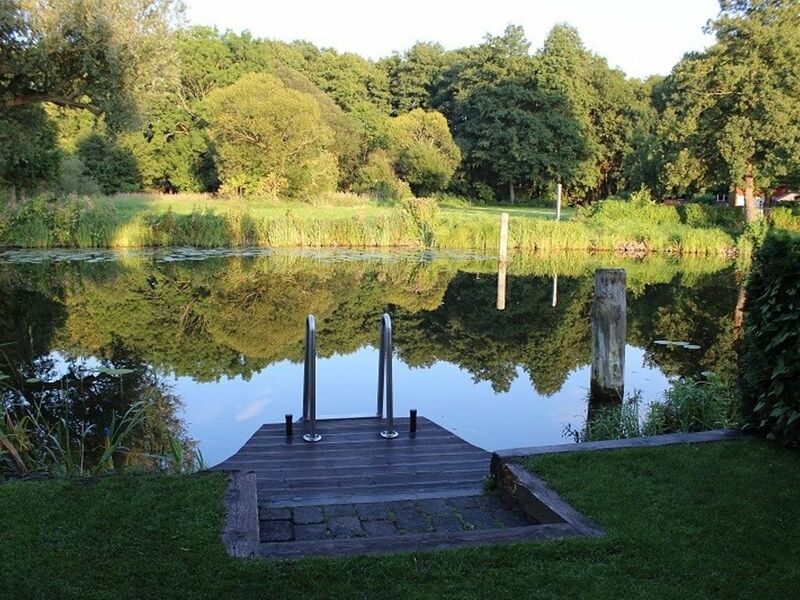 Our comfortably furnished bungalow is located directly on a water plot on a public waterway (with swimming ladder) in the small fishing village Altfriesack. Here you can go hiking, horse riding, fishing, canoeing and boating, mushroom picking and cycling tours or even by car or Train to get to know the area. But if you just want to relax, you are exactly right with us. From our living room you can watch the heron directly at the fish consumption. If you are then totally exhausted from your activities or frozen through on colder days, you can relax and take a warm full bath or a warm shower (indoors or outdoors). The evenings can be spent either around the campfire or in the living room by the stove, after you have finished your fishing for the existing smoker at the fish preparation place. In the nearby fishing Pfefferkorn with beangelbarem carp pond you can enjoy delicious fish, especially recommended, the Zander. Wustrau-Radensleben Train Station is 1.4 km away. Small pets are possible by arrangement for an extra charge! Specials can be booked on request. Stand up paddling and sauna incl .. 1 parking incl . ; Bed linen (7 EUR per person) and towels (5 EUR per person) on request, or bring your own; Boat can be rented on request, with bathing ladder, electric motor. Bookable from 3 nights! From 10 nights there is a free night, d. H. 10 nights and only 9 pay! Golf course in Wall 13 km away, about 15 minutes by car. Airfield Fehrbellin (skydiving, balloon flights, motor gliders, helicopters, etc.) 13 km away, about 15 minutes by car. Vertraute Atmosphäre in sehr gemütlicher Unterkunft! Vielen Dank an Familie Hilger!!! entspannten Kurzurlaub in sehr sehr gemütlicher Atmosphäre. gemütliche Sauna mit Blick auf‘s Wasser. Ob im Garten oder im Wohnzimmer, Blick auf‘s Wasser hat man immer. Wunderschön! Es gibt ein ganz tolles Fischlokal in fussläufiger Nähe! Unbedingt hingehen!! Außerdem hat das Dorf auch ein Dorfkneipe...auch ok! Rundum ein schöner Aufenthalt in einem freundlichen Dorf mit vielen Wandermöglichkeiten, Tierbeobachtungen, Angeln und auch Stadterkundigungen wie nach Neuruppin lassen sich von dort gut machen. Nette Vermieter und eine wunderschöne Unterkunft, die viel zu bieten hat mit Liebe zum Detail. Wir waren mit allem sehr zufrieden. Der Bungalow ist sehr gemütlich, sauber und es ist alles vorhanden, was man so braucht. Außerdem sind die Vermieter sehr freundlich und es hat alles gut geklappt. Wir können dieses Ferienhaus nur weiterempfehlen!!! Ruhige Lage, Bungalow nett eingerichtet, alles da was man für einen Urlaub braucht. super entspannend, einfach nur Ruhe und Erholung, viel Natur - wir haben uns sehr wohl gefühlt!